An article published in the journal “Current Biology” describes the study of the tail of a small feathered dinosaur dating back to about 99 million years ago preserved in amber. A team of researchers led by paleontologist Lida Xing of the China University of Geosciences in Beijing examined the fossil, the first preserved in this manner directly associated to a dinosaur. The discovery of this remarkable fossil was lucky because Lida Xing found it in a market in Myitkyina, Myanmar, in 2015. Recognizing it as potentially interesting, he advised the Dexu Institute of Paleontology to buy it. Along with other researchers, he submitted it to CT-scan and microscopic observations to better understand what it was and the characteristics of the fossil clearly indicated that it belonged to a dinosaur and not to a bird. The discoveries of fossils in amber are extraordinary because they’re preserved in an excellent way but generally those are very small animals such as insects or parts of larger animals or plants. Feathers dating back to the era of dinosaurs have been found in amber in some cases but this time it was possible to find evidence that the fossil really belonged to a dinosaur and not to a bird. The piece of amber, cataloged as DIP-V-15103, is small and the tail fragment imprisoned in it is about 3.5 centimeters long. The feathers that cover it indicate that the tail had a chestnut-brown color on the upper surface and pale or white on the lower surface. The 8 vertebrae found are not fused in the pygostyle that we can find in modern birds, a clear indication that belonged to a dinosaur. According to the researchers, the tail belongs to a dinosaur of the coelurosaur (Coelurosauria) group, theropods that included large predators such as T. rex but also some of the smallest dinosaurs known such as Maniraptora. According to one interpretation, Maniraptora might also include birds and if that was verified the species the fossil subject of this research belonged to would be a fairly close relative of birds. 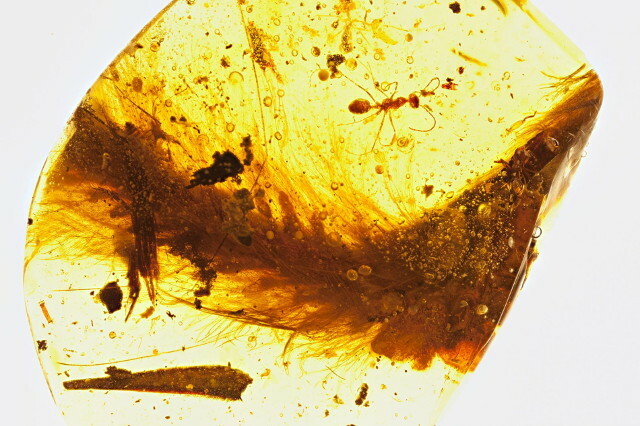 The fossil contains fragments of feathers, bones, flesh and skin, but also allowed to examine the tail chemistry in the area that was exposed as a result of a cut made before the piece of amber was purchased. The result was the discovery of the presence of ferrous iron, probably what remains of hemoglobin that was also trapped in the sample. Ryan McKellar, another of the authors of the research, stated that amber allows to preserve the fossils very well in three dimensions with many microscopic details difficult to study in other situations. The chemical analysis could also provide new information, for example on the keratin of which the feathers were composed. The precise relation of this specimen with other feathered dinosaurs and birds is still to be understood. It’s possible that in its species feathers served to adjust its temperature or as an ornament, but could not fly. The researchers hope to find more fossils of that kind in Myanmar and believe that they could provide important information on the evolution of plumage.